As well as playback of traditional audio compact discs, the MEP-7000 supports MP3/AAC/WAV2/AIFF2 stored in USB memory devices, hard disc drive (HDD), CD-R/RW and DVD±R/RW, allowing for easy playback of existing music libraries and new digital downloads. In addition to the high-resolution 4.3-inch color LCD panel, an intelligent graphic user interface and rotary selector enables rapid track search through large collections of digital audio files. A play list function also speeds the track selection process for recalling frequently played songs. An auto mix function automatically mixes playback of the tracks registered on the play list in four modes such as ECHO or ZIP. Audio is seamlessly beat matched and mixed on the fly. 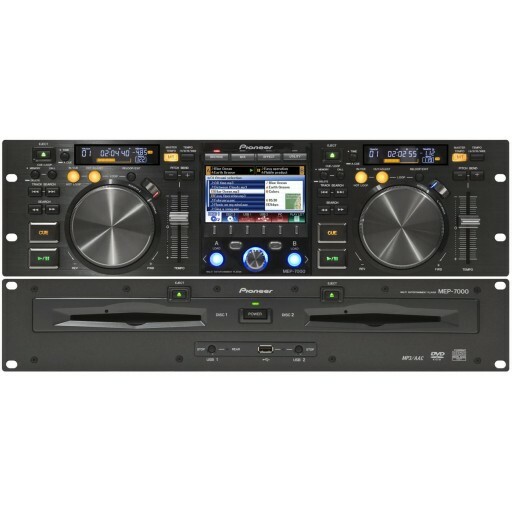 The MEP-7000 includes Pioneer’s DJS all-in-one DJ software application for playback from a Windows based computer (PC not included). When the system is connected to the DJS, no mouse or keyboard is required for navigation and DJ performance. The MEP-7000 also supports control of other software, such as SERATO Scratch LIVE4, without the need of the control discs. It can also act as a full MIDI controller for any MIDI-compatible PC application. In addition to traditional scratching, the MEP-7000 also features two patterns of Scratch Jog Effects – BUBBLE5 and TRANS5. Three Digital Jog Break effects freely control the audio effects according to the rotation of the jog dial—JET6 / ROLL6 / WAH6—broadening the scope of any DJ performance. Two high-visibility OEL displays provide outstanding visibility for the pitch, playback time and position information. Together with its main 4.3-inch color LCD, the OEL display ensures smooth DJ play regardless of lighting conditions. Karaoke Mode: Full support for CD+G playback for karaoke performance via the composite video-output. Library Function: Allows selection of tracks from various categories like genre, artist, etc., when using the unit with DJS or USB. Tempo Control Range: The user can choose among four pitch ranges available for the tempo slider: ±6%, ±10%, ±16%, and WIDE8. Pitch Bend Button: Enables fine adjustment of the track speed by simply pressing a button. Seamless Loop: Repeats looped audio without interruption. A loop can be set from as small as one frame up to an entire CD’s length. Hot Loop: Restarts the loop seamlessly from its entry without interruption of the music.